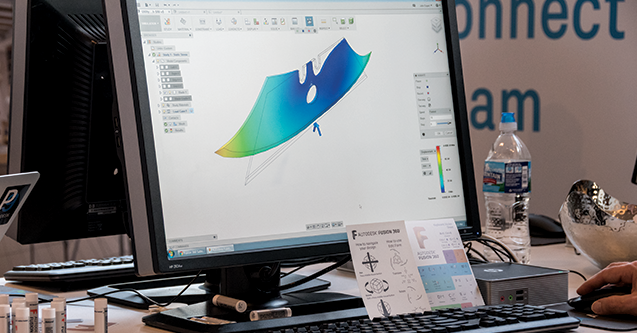 Read on as we answer these questions and more while helping you determine how Fusion 360 can work with your current tool set. So What is Fusion 360? Autodesk Fusion 360 is a collaborative, cloud-enabled design platform that has all of the features mentioned above and more. It includes all the tools you need to go from design to fabrication, without having to leave the tool. Let’s say you want to design a chair. First, we need to create the design from scratch. As you can probably imagine, a chair has its fair share of geometric and ergonomic features. In Fusion 360, you can create these features in its parametric and sculpting environment. We can then run tests in the simulation environment to ensure it can withstand the necessary force. After the validation process, toolpaths can be made to machine the legs in the CAM environment. Finally, we can watertight the body and send it out to manufacturing. How Will It Work With My Current Tool Set? Fusion 360 works alongside your current software. If you want to create organically shaped models not supported with your current 3D modeler, you can do so in Fusion 360’s sculpting environment. Further, if you want to create toolpaths for your model so the mill or lathe can cut your part, you can use Fusion 360’s CAM environment. Importing and exporting from Fusion 360 is also a breeze because it supports various file types, including SolidWorks and Inventor files. Take a look at all the different file types supported in Fusion 360. Fusion 360 has a low, competitive price. In fact, for hobbyists and enthusiasts, it’s free. The Fusion 360 team is looking to startups and entrepreneurs to have the tools they need to run their business successfully without big startup costs. There really is no reason to not test out Fusion 360 and see how it works for you. What Makes Fusion 360 So Important? Fusion 360 is important because it’s a utility software tool that can do everything in one place. You can crate 3D designs, collaborate, manage data, create toolpaths, run simulation to validate your designs, and much more. It is a next generation design tool that will continue to have a huge impact on the community. Watch below for a deeper understanding of Fusion 360 and how to get started. How Can I Get Started in Fusion 360? Anyone can download a Free Trial of Fusion 360 here. And for many people like startups and hobbyists, it’s just free. Want to learn more but don’t know where to start? Join Autodesk Fusion Fridays! On the first Friday of each month, we hold free 30-minute webinars going over the latest Fusion 360 updates while demonstrating modeling and software techniques. We want to hear from you. If you want to suggest a topic for the next Fusion Fridays video or if you’re stuck somewhere in Fusion 360 and need us to take a look, email us at Questions@KETIV.com. I am new to Fusion 360, took a class in it, and still find it insanely hard to navigate. It s a chore even to try to cycle back to the basic tutorials. Excessively time consuming. Sorry to hear about your past experience using the tool. Did you come from another software by any chance? I personally used Solidworks before Fusion 360 and was not used to it in the beginning. Like learning any new software, it took some time to learn about the features that are unique to Fusion 360 such as the data panel. In terms of mouse movement, Fusion gave me the option to stick with the Solidworks option under “Preferences”. Let me know what in particular you would like help on so we can find the best way to overcome it!